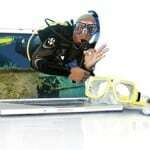 Euro-Divers Worldwide is a modern company employing modern management techniques. We place great emphasis on employee development ensuring that all our team members have every opportunity to build up long rewarding careers in the diving industry. Prior to commencing your PADI divemaster internship program you should get familiar with some information that will simplify your understanding and adaptation to your new career, the place where you will be staying and the conditions of the internship. Our many years of experience show our philosophy, and highlight our performance. Each of our PADI 5 Star centres employs highly qualified multi-lingual instructors, teaching courses from beginners up to assistant instructors in our guests’ native language. Our internal training programs also cover related areas such as customer service, communication, sales skills, organisation skills and software courses. We employ over 100 instructors from many different countries. Euro-Divers goal is to provide guests with a top diving product giving them access to the best dive spots in the different areas where we are present, in a safe and friendly manner. Through the years we have managed to establish a solid brand name and an excellent reputation as training centre for divers of all levels. We abide to PADI educational standards, to local diving regulations and we have our own policies and procedures contained in our Dive Safety Management System.